Japan's Princess has announced her engagement. She is apparently engaged to a non-royal. She has also had the Emperor's approval. Her name is Mako Naishinnō, she is widely known in the world as simply Princess Mako. 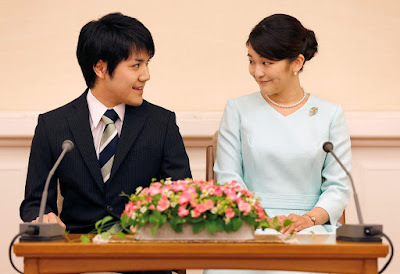 This marriage will make her lose her royal status, under a Japanese law that states that if a female royal marries a commoner then she loses her royal status. However, the law reportedly does not carry over for male royal members. The romance is with Kei Komuro and the Princess said she was attracted to Komuro's "smile like the sun". The Princess also reportedly said: "I've been aware since my childhood that I would lose royal status once I married,"
"While I've worked to help the emperor and fulfill duties as a royal family member as much as I can, I've been cherishing my own life." She said. She met Kei Komuro while they were studying at the same university five years ago. Kei Komuro is apparently a 25-year-old law firm employee. He described Princess Mako as someone who watched over him "like the moon". This was reported in May by Japanese news sources, it was confirmed recently when the announcement was made by Japan's Imperial Household Agency. This announcement has certainly made a lot of people happy. It's not often that you hear news like this. It's always something to get people from pretty much everywhere excited to follow.